This Exreme Party featured an electric blue, extreme green and bright orange color palate. Teck Deck mini skateboards served as the placecard holders. The extreme entrance was a graffiti brick wall. Centerpieces were “knarley” lighted glass heads with real bike helmets-which will be donated to the Boys and Girls Club of Indianapolis. We hung sillouttes of snowboarders, roller bladers and skaters from the ceiling. Excellent Entertainment included a DJ, Tatoo artist, photo station, extreme ice cream station and knarley nachos station. Pretty rad huh? 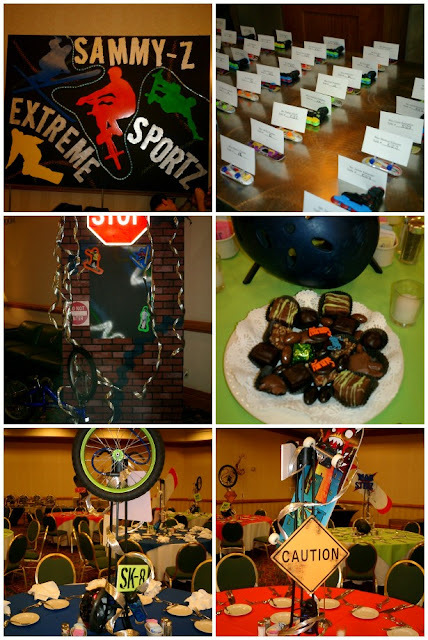 This entry was posted in Extreme Sports Bar Mitzvah, Xtreme Sports party on February 1, 2009 by Setting the Mood. Here is a party we created with an Exreme Sports theme. We used real bike parts, skateboards, and in line skates. The placecards were mini skateboards, snowboards and skates. This entry was posted in Extreme Sports Bar Mitzvah, Sports Party, Xtreme Sports party on September 21, 2008 by Setting the Mood.